I know it’s barely passed Mother’s Day, but in case you’d like to get a jump on Father’s Day, I thought I’d get this posted. I actually did this for My Mr. Right’s birthday back at the end of April, but it would be an awesome Father’s Day gift, too. We don’t drink alcohol, but we do love us some good sparkling juice. Costco sells the IZZE brand in a twelve pack during the summer months. Sometimes it’s hard to find during the winter though, so you may want to plan accordingly. Luckily, Father’s Day is right around the corner… and if it would stop snowing, maybe so is summer! Eeeee! That’s my excited squeal. But you can always buy root beer or other soda at the grocery store or Wal-Mart. It’s sold year-round. 1) Obtain 6 (you could do more or less, as you desire) empty, clean glass bottles. I used the IZZE brand from Costco, as mentioned above. We had to empty the bottles (a horrible sacrifice… lol) before I could do anything with them. Make sure you wash them thoroughly and let them dry completely before you try to fill them. There’s nothing worse than gross candy. 2) Gather your fillers. My Mr. Right LOVES Whoppers, so he got two bottles of those. Popcorn for the movies, Peanut M&M’s, and soft Worther’s caramels rounded out my fillers. 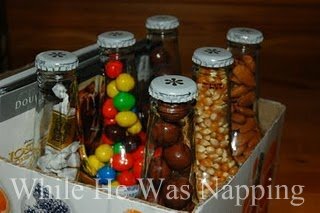 3) Fill your empty bottles with the candy or whatever else you want to fill them with. Put the lids back on. The easy part is done. 4) Now, this part takes some time, but it makes the gift. If you’re rushed you can stop here, but I promise this next part is totally worth it. 5) Create a label for your bottles. I included an ingredients list, manufactured information, the big label and a note from us, wishing Daddy a happy birthday. It might be fun to create a nutrition label too. I created my label in Photoshop. Measure your bottle for the correct dimensions. Print and trim to the correct size. I used the hot glue gun to secure them, as it was quick and easy. 6) If I’d had a few more hours to cross off all the things on my to-do list that day, I would have covered the box and made it all cute too. But, I ran out of time. So, if you’ve got some extra time decorate your box all cute! Such a fun idea! Love this! This is such a cute idea!!! My hubby spends a lot of time at the office, and something like this would be great for him to take there so he can snack during the day! Then… he will think of the kiddos every time he reaches for a snack! Cute cute! Oh, come on, this is a great hit, eh. haha. Very thoughtful and full of love gift. Love it! LOVE this idea, guess I will have to go sacrifice and drink some 🙂 Thanks so much for this, keep them coming! Haha! What a great idea! I created something similar just last night, too funny:) Thanks for sharing! I love this idea. I linked to your post for a great father’s day idea. Thanks for sharing such a great idea. So cute!!! Would love for you to share them at the Pretty Packages Party! So cute! I pinned this to pinterest! I am visiting from Tatertots and Jello and I would LOVE if you would link this up to my Delicately Constructed Fridays Linky Party!! Super cute idea!!! Totally fitting my husband! I just posted a link to this project on my blog! Thanks for sharing! VERY cute! I love how it is something that you could easily do for cheap…. coupons could totally be used here =) I’m a new follower. Would love it if you could stop by and say hi, or link up to Memory Mondays Blog Hop! I LOVE this idea and totally pinned it so I dont forget thank you for the idea. I love this! I’m filling my dad’s bottles with coffee beans, cashews, popcorn and pistachios. I think I’ll let my 4 year old make some labels for them. Thanks for sharing! Oooh, I love your Father’s Day pack! I would LOVE to have you share this at my For the Kids Link Party! Stop on by and join the fun! WHAT A GREAT IDEA!!! My hubby is a definite snacker and if its just in a bag on the counter, I will eat it all up, but this makes it fun for him and reminds me to keep my hands off of it too! I love it! That’s a great idea! I love the popcorn in it because my husband isn’t eating sugar at the moment. Love this idea!!!! Very creatie. great idea- we drink the root beer from Costco-I have always wanted to use them in some other way! I’d love it if you share this @ Workshop Wednesday! It would make a great addition to the party! Great idea! We happen to be opening a brewery, so I know where to find some bottles 😉 I think he’d get such a kick out of a gift like this! I’ll have to think a while on how to present it and what to put in the bottles…you’ve definitely inspired me, thanks!! So it looks like my previous comment got deleted (during the dang blogger outage, I would guess), but I just wanted to say that it’s so nice to find another NV blogger . I get the are-you-from-the-moon look when I talk about it, too! What a fun project for Father’s Day! I love it! I would love to have you share this at my For the Kids link party! Come join the fun! I’m with seeRsew… Did you hammer the caps back on? So cute- love the “ingredients” label! We would love for you to show this off at our weekend link party! Years ago as a single mom, money was very tight one Christmas. I filled bottles with my girls favorite candy and tied pretty ribbons on them as gifts. You would have thought I had hung the moon! They loved it! I love your movie night idea. I hope your husband knows how blessed he is! Wait… how did you get the lids back on? are they secure or just set on top? This is a great idea! I was just brainstorming for Father’s Day and this helped! I think we will use Tim Horton coffee cups. Thanks for sharing! This is too cute! I just brought home a drink caddy from Sonic that would be perfect for this! This is just so cute and probably will be enjoyed WAY more than another shirt or tie! Thanks for sharing! This is a great idea! And it is something my four year old could help me make for Father’s Day. Thanks for this! A great Father’s Day idea! This is so cute! Something the kids can totally help with. Thanks! Cutest idea ever. I’m obsessed and will start making one tonight. Thanks for the great idea! So cute! Thanks for sharing. I’m a Nevada girl, too! Such a great idea! I cant afford to give him what he would really like and you can only give so many shirts! What a fun idea..my girls are going to love making their Daddy a six pack. Thanks for sharing. This is adorable! I love this idea for Father’s Day as well. Guess I know what my husband will be getting. I’m popping over from Get Your Craft On! Thanks for the great idea! So so clever! I love it! I am in need of father’s day ideas and this just may work! You know, a thought, you could even make a teacher 6pack as a beginning of year gift. You could fill with paperclips and stuff. Hmmm. So many crafts. So little time! This is the best idea ever! Thanks for the heads up,how creative is this.SO cute! I am totally going to do something like this!Thank you thank you! Thanks for this wonderful idea! My hubby doesn’t drink either but loves Root Beer and Yoo-Hoo. Now I have an early start on his Father’s Day present! You rock!